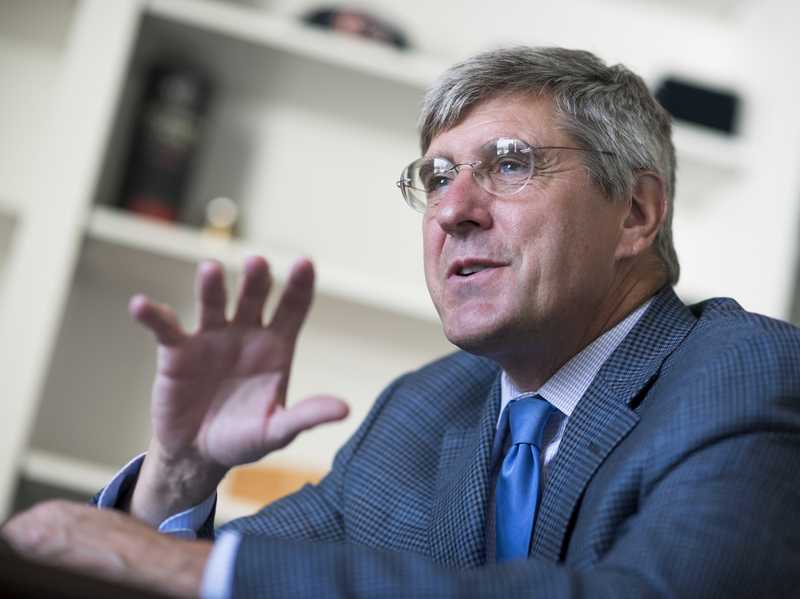 Stephen Moore, Trump's Pick For Fed Post, Draws Fire From Economists President Trump's pick for a seat on the Federal Reserve Board is drawing mounting criticism from economists of all stripes. Moore says he has the right experience, but critics fault his track record. President Trump said on Friday that he will nominate conservative TV commentator and former Trump campaign adviser Stephen Moore to the Federal Reserve Board. "I have known Steve for a long time – and have no doubt he will be an outstanding choice!" Trump tweeted. The IRS is trying to collect more than $75,000 in back taxes from Moore, according to tax lien records first reported by The Guardian. Moore is disputing the tax. Even before that news broke, the idea of installing Moore on the central bank's governing body had prompted a strong backlash. "Almost universally, economists have spoken out and said this is not a fit candidate for a board position," said William Luther, who directs the Sound Money Project at the American Institute for Economic Research. Moore has spent decades opining on economics — at the conservative Heritage Foundation, on the editorial pages of The Wall Street Journal and on cable TV. "I've been a economic policy person in Washington for well over 30 years," Moore told NPR's Morning Edition. "So I do think that I have probably more experience in this game than many, many other people and in fact a lot of the people who have served on the Federal Reserve Board." It's precisely that track record that worries many economists. "More than possibly any other economist in modern America, he has a track record of getting the big issues wrong," said Justin Wolfers of the University of Michigan. "Not just occasionally but time after time." During the Great Recession, for example, Moore complained that the Fed's efforts to prop up the economy with low interest rates would spark runaway inflation. That never materialized. Today, with unemployment below 4 percent, Moore is making the opposite case, warning that by raising interest rates last year, the Fed was causing a dangerous drop in prices, or deflation. That prompted a testy exchange in December on CNN with Washington Post columnist Catherine Rampell, who pointed out — correctly — that none of the indicators watched by the Fed show deflation. Critics say that Moore's counterintuitive prescriptions for Fed policy — tight money in bad times, loose money in good — seem to be guided more by who's in the White House than any objective measure of the economy. "If your goal is to stabilize the macroeconomy, then Stephen Moore's policies go in exactly the wrong direction," said Luther of the American Institute for Economic Research. "If instead your goal is to push Democrats out of office and get Republicans re-elected, then Stephen Moore's policies make perfect sense." Opponents say that this partisan bent could jeopardize the Fed's reputation for independence and apolitical action. Moore's credentials as a partisan player are well-established. He was one of the founders of the Club for Growth, which advocates limited government and low taxes. In 2012, Moore helped design a tax-cutting experiment in Kansas that blew a big hole in the state's budget but failed to produce the promised economic boom. "There is this segment of economists who want to believe, whether the facts support them or not, that low-tax states will grow better than other states," said Miriam Pepper, who was editorial page editor at The Kansas City Star. "It certainly didn't work in Kansas. It was a disaster, so they've had to retreat." Eventually Kansas lawmakers changed course and reversed the tax cuts. Nevertheless, Moore wrote an op-ed for the Star in 2014 defending the cuts and insisting that low-tax states outperform others. Only after the column was published did Pepper and her colleagues discover that Moore had his numbers wrong. When the paper ran a correction with the right numbers, the data didn't support Moore's argument. "That kind of factual error is just unacceptable," Pepper said. "While he was the so-called top economist at Heritage, we decided we were finished with him." Even conservative economists who might share Moore's policy preferences have spoken out against his nomination. Harvard University economist Greg Mankiw, who advised then-President George W. Bush, wrote that Moore doesn't have the "intellectual gravitas" for an important job like the Fed. Professional economists don't have a vote on Moore's nomination, though. Senators do. And so far no Republican senator has spoken out in opposition.